If you are a minor, please visit the club during staffed hours with a parent or legal guardian to purchase a membership. Bi-weekly installments must be paid through your bank account. Please provide the info below to allow your payments to be withdrawn directly from the account of your choosing. 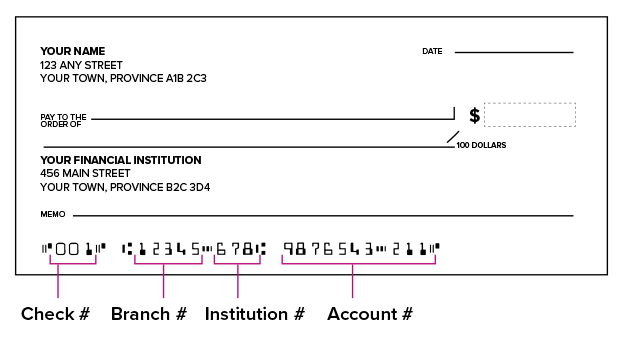 Your bank information can be found on one of your personal cheques (see image) or through your online banking account. Choose your preferred method of payment: Credit, Debit, INTERAC Online, or Direct from your bank account. Please ensure you are using the correct method of payment to complete this transaction. If your debit card states Visa Debit or MasterCard use the Credit or Debit Card option above. When you place your order, you will be transferred to your online banking website for payment. The INTERAC® Online Service will debit your online bank account for the total amount of today's purchase. Withdraw today's payment amount using the bank account information provided during the signup process. Your payment will be processed through your bank account in 3 to 15 business days. Terms and Conditions have failed to load for your current province. I hereby agree that I am assuming all risks of injury to myself and others, including any illness or medical condition, which may result from my use of the Facilities. I hereby agree TO WAIVE ANY AND ALL CLAIMS that I have or may have in the future against Fit4Less by GoodLife and its affiliates and their respective directors, officers, employees, agents, representatives, successors and assigns (all of whom are hereafter collectively referred to as the “Releasees”), and TO RELEASE THE RELEASEES from any and all liability for any loss, damage, property damage or theft, expense or injury, including death, that I may suffer, or that my next of kin may suffer, resulting from either my use of or my presence in the Facilities, DUE TO ANY CAUSE WHATSEOEVER, INCLUDING NEGLIGENCE, BREACH OF CONTRACT, OR BREACH OF ANY STATUTORY OR OTHER DUTY OF CARE, INCLUDING ANY DUTY OF CARE OWED UNDER THE OCCUPIERS’ LIABILITY ACT, ON THE PART OF THE RELEASEES, AND ALSO INCLUDING THE FAILURE ON THE PART OF THE RELEASEES TO SAFEGUARD OR PROTECT ME FROM THE RISKS, DANGERS AND HAZARDS OF PHYSICAL ACTIVITY AND ANY USE OF THE FACILITIES.